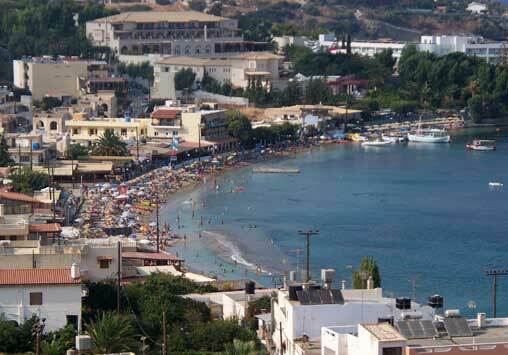 Agia Pelagia is a bustling coastal resort town on the North coast of Crete with two beaches, picturesque views and an excellent range of facilities. 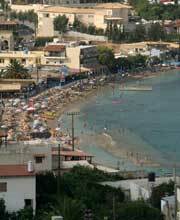 One of its beaches lies in front of the main resort, where all the bars, cafes and tavernas are concentrated. The beach is sandy and sheltered from the North and North westerly winds making it very calm and ideal for swimming. 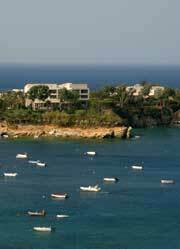 There are plenty of facilities for sunbathing, swimming and sea sports. There is a wide range of accommodation available including hotels and rooms to let. 1 km East of Aghia Pelaghia is a small sandy beach which can be affected by the Summer North winds. It does not have many facilities but its proximity to Agia Pelagia allows you the benefit of those facilities while enjoying the peaceful isolation of this beach. 10 km from Heraklion. Access from Heraklion is easy with a regular public bus service or you can use your own transport.